Health and Fitness Expert Stephanie Mansour reveals the top five dieting disasters people most often make and shows you how to avoid them! Steph dropped by WGN to talk about practical and proven ways to overcome obstacles to keep meeting your weight loss and workout goals. You can enjoy your favorite treats and still lose weight. Just because you’re on a diet doesn’t mean everything is off limits! By learning to slow down and savor just one dessert, you can save yourself from eating the whole box of donuts in a moment of weakness. As a private weight loss coach, I really preach a holistic lifestyle. A healthy mind, body, and spirit begins with moderation and balance. So give yourself permission to indulge with intention every now and again. OK, so let’s say you did eat that whole box of donuts. No biggie. Keep drinking water, eat that zucchini dinner, take your probiotic. Step it up any way you can even if you feel like you’ve blown your diet. Small choices and changes make a big difference. Don’t throw in the towel on your weight loss goals just because you gave in to a sugar craving. Keep going! You got this. Not getting the results you want or the results you were getting in the beginning? That makes sense. When the body gets used to a workout routine, it can plateau. That means it’s time to change up your workout. If you aren’t strength training already, add that into your cardio routine and you’ll start blasting calories again. If you’re feeling just straight up unmotivated, and absolutely dread working out then cut yourself some slack. Switch up your exercise routine and make it more fun. Forget the gym and go take a walk around a lake instead. Play frisbee with your kid. Jump on your bike and ride to a juice stop for a healthy, fun treat. When you do something you like to do, it trains your brain to like exercise, which makes it easier to choose to get out there and sweat in the future! If you’re bored with your workout, try my quick fat blasting workouts on my Signature Slimdown Workouts DVD–guaranteed to help you tone up, get fit, and slim down fast! Not a morning person? Don’t set your alarm for an early morning workout! Look at your calendar and see if there’s anywhere you can be more realistic with your weight loss and fitness goals. Maybe it’s as easy as changing the time that you work out. Maybe it’s as simple as getting more sleep. One of my private weight loss clients lost 20 lbs in just three months and all she focused on was drinking more water, sleeping 8 hours a night, and eating protein. She only worked out twice! Health and Fitness Expert Stephanie Mansour swung by ABC Chicago to share easy hangover tips and tricks to get you back on your feet after a night of cocktails. 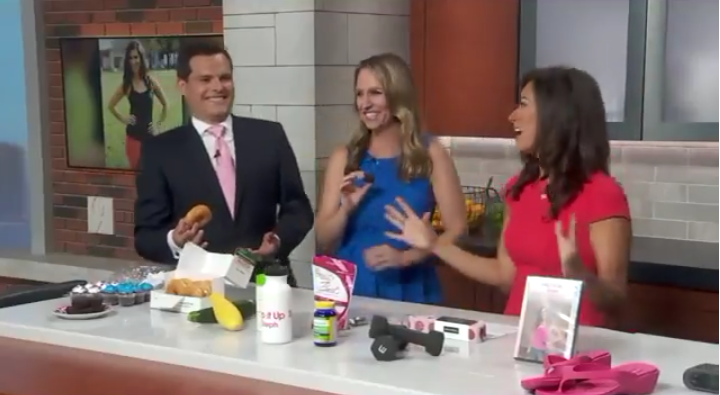 Click to Watch Hangover Cures As Seen on ABC Chicago! Even if you don’t drink a lot, sometimes just one glass of bad wine can leave you nauseated come morning! If you’ve been following a weight loss program, your tolerance for alcohol has probably gone down too, leaving you more susceptible to hangovers. Here’s exactly what you can do the morning after a party to cure a hangover and feel better fast! Step up your hydration game and chug some coconut water or watermelon juice. Drink little sips of water consistently—up to one liter per hour to properly rehydrate your body. Avoid sugary sports drinks and don’t give into the temptation of coffee! Coffee is a diuretic and actually increases dehydration. Peppermint Altoids: Peppermint soothes and settles the stomach. Ginger Chews: Ginger is amazing! It cures indigestion and reduces nausea. Green Tea with Mint: Soothing, comforting, and hydrating! Drink the tea but also inhale the aroma deeply for an added therapeutic benefit. Your body is depleted of potassium and your liver is working overtime to process the alcohol from the night before. Restore vital nutrients and boost liver functioning by getting plenty of green leafy vegetables like my favorite—arugula! Hate eating veggies? Drink a green juice instead! Bananas with oatmeal or some eggs and toast are easily digestible and full of the vitamins and amino acids your body needs to cure a hangover and recover from a night of drinking. If going to the gym sounds like way too much effort, then here is a less intense option! This yoga move is a great trick to ease hangover symptoms. The Forward Fold: Stand up slowly and bed at your waise as you fold forward. Let your head dangle and your chin reach your chest. Hold on to opposite elbows and just dangle and breathe for at least 60 seconds. Sway gently from side to side to massage your internal organs and keep things flowing (this helps them detox after a long night!). This yoga pose releases tension in the neck and head, it helps regulate blood pressure, and can soothe a headache. If you want more tips on how you can lose weight and keep it off, make sure you join my FREE 21 day challenge at stepitupchallenge.com. I recently wrote three new articles for Today.com about the best workout products for women! I love being able to share my tips because, as a personal trainer for women, I get asked about my favorite products all the time! I love wearing workout clothes and my clients in my weight loss programs are always looking for the best of the best! You can trust that my love of these products comes with tried and true experience. Read the articles to check out my favorite dry shampoos, bras and fitness trackers that are time-tested and fitness approved! Read the full article about how “This dry shampoo makes me feel like I just got a blowout,” to find the perfect dry shampoo for you! Next up, the best sports bras are hard to find. I recommend sports bras for my clients who are working out intensely, and I wear them myself for all my workouts. A sports bra is important to hold you in place and also avoid pain to your breasts (there is such a thing!). My favorites are featured in the article and are from the stores below. Read “After years of searching, I finally found the perfect sports bra!” to learn which of the featured bras is my absolute fave and THE best! 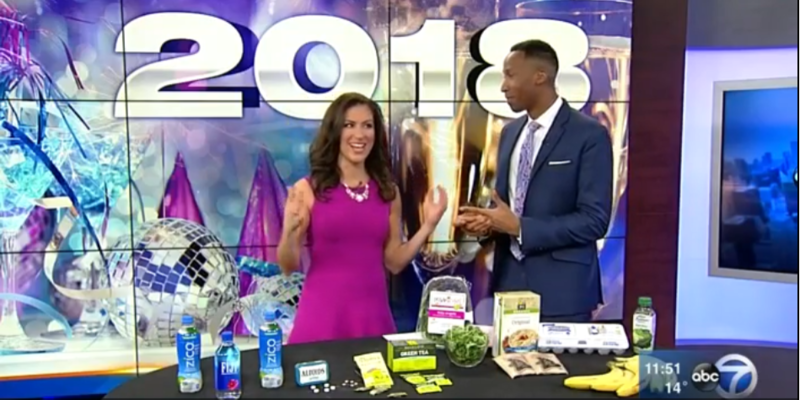 Weight Loss Coach Stephanie Mansour and Fox 32 discuss why the best thing you can do at the holidays is to focus on maintaining your current weight instead of trying to lose weight! With cocktail parties filling up your calendar, don’t worry about trying to make healthy choices during festive events; instead, focus on other small moments in your day that you can control. Don’t set yourself up for failure by trying to lose weight over the holidays. The reality is we all eat and drink more at holiday parties than we normally would. So, why fight the facts? I encourage all my clients in my weight loss programs for women to focus simply on maintaining not gaining weight for the next five to six weeks. How can you do that as well? Well, the main thing is to make your new goal: weight management and feeling confident in your choices. Here are three ways to make confident choices and to feel in charge even amidst the holiday chaos and temptations! Don’t track workouts or meals. Use a calendar to track all your social activities! Remember it’s just a fact that on these days you will be eating more unhealthy foods and drinking a couple more cocktails. Give yourself permission to enjoy yourself at the party, and focus on healthy choices you can control at other points in the day. Weight Maintenance Pro Tip: If you do want to make healthier choices at cocktail parties, choose sparkling water with a splash of fruit juice as a mixer instead of sugary carbonated beverages. Also go for clear liquors or wine as both options are an easy way to cut out tons of unnecessary calories. Out at a dinner with colleagues and don’t want to make a scene by just ordering a salad? I get it. Order your main entree and then just ask for a side of vegetables! This way you can splurge with your colleagues while keeping some control of your health with a nutritious vitamin and fiber packed side option. On the run in the morning with no time to make a healthy breakfast? Make a smoothie with fruits and green leafy veggies and stick it in a to-go cup. You heard me! Why try to schedule a 45-minute workout when you’re struggling enough as it is to check everything else off your to-do list? The holidays are a hectic time, so ditch your normal workout routine and go for a 15 minute workout or even a five-minute workout. You can even check out my workout DVD. It features a whole bunch of five minute workouts from Pilates to core to arm workouts and more. Doing a five-minute workout is enough to get your mind in gear and help you feel accomplished and awesome! When you do a mini workout, your brain gets happy and you automatically feel proud and accomplished, which means— you’re even more likely to make healthy choices throughout the day! Go for anything that makes you feel good. Try foam rolling or meditation or a walk in nature—anything that helps you feel in charge of your time and holds you accountable to health. Remember—don’t stress! Just maintain. Happy holidays! Weight Loss Expert Stephanie Mansour dropped by Fox 32 to share a fun Turkey Workout to do with your family on Thanksgiving Day. Before you cook your frozen bird, take it for a spin around the kitchen and burn some calories with these four easy workouts! Remember, after you stuff your face this Thanksgiving you can always step it up and get back in shape before New Year’s! Clients in my weight loss programs for women learn one key to a healthy lifestyle is knowing when to indulge and when to stick to the plan. That’s why they have so much success shedding the pounds and building strength between Thanksgiving and Christmas! These workouts prove exercising doesn’t need to feel like a burden or a chore! As a weight loss coach, I love mixing up my workouts with fun and funny challenges that bring family and friends together to stay healthy and happy all year long. I recommend a 7-10 lb turkey, but you can also grab a lighter weight Cornish Hen if you’re still building up strength! Grab your Butterball and hold it high! Lunge to the side and bring the turkey down. Then twist, pull abs in, press up while lifting the turkey high. Repeat 10 times per leg! This works the arms, legs, and core! Stand with feet slightly wider than hips. Hold your turkey in front of you with bent arms. Squat down while pushing the turkey forward. Stand up pulling the turkey back to center. Repeat 10 times. This partner workout is a great ab exercise. Sit down with your partner with your feet facing each other. Lean back halfway and have your partner toss you the bird. Catch the bird and then as you crunch up toss the turkey back to your partner! 10 turkey tosses per partner! Fitness Expert & Weight Loss Coach Stephanie Mansour shares ways to detox after the big Thanksgiving feast. Learn how to go from bloated to shrunk in no time at all with anti-inflammatory foods that support detox and weight loss. Clients in my private weight loss program for women actually lose weight after big holiday meals! Surprised? It’s because motivation to do a detox is high after all that indulging, so while they’re cleansing their bodies to decrease the bloat and feel good, they’re also shedding the pounds at the same time. Check out these quick and easy ways to detox after a big meal. Give your body a rest with a morning juice detox! Buy juice at the store or make your own. The best juices have greens in them, so add spinach, kale or collard greens if you’re making your own. Green leafy vegetables help flush out toxins because they are anti-inflammatory. Don’t forget to add seeds. You can use chia seeds, flax seeds, or even pumpkin seeds! Seeds provide fiber to help you feel fuller longer. Thanksgiving was all about enjoying the breadings and the sauces, but now it’s time to look away and eat clean. Forget the breadcrumbs and fried yumminess, go for a plain steak or chicken breast with nothing extra added. Add some of the greens you use in your morning juice to your dinner meal and you’ll be golden! Don’t worry. Eating clean and lean can still be delicious! Turmeric, ginger, and garlic are amazing spices because they have strong anti-inflammatory properties and speed up your metabolism (and they taste great too!). Remember to stay away from salt though! These spices will help flush out all the excess sodium in your body after Thanksgiving. Mix up an olive oil and ginger-garlic dressing for your greens. Or, try chopping up garlic, ginger, or turmeric to add to a pan of veggies for roasting or to sauté in a skillet with other food. Drink half your body weight in ounces of water every day! Water supports your detox organs and helps them flush toxins and excess sodium out. Your urine should be nearly clear whenever you use the restroom. Flavor up your water with a squeeze of fresh lemon, or add other fruits to a large pitcher to create an yummy infusion. You can also try a special Detox Tea or take a Ginger Supplement to help you hydrate and flush your body. Weight Loss Coach & Yoga Instructor Stephanie Mansour stopped by Fox Chicago to share a gratitude meditation perfect for the Thanksgiving holiday. Meditation builds confidence and positivity which is why it’s an important part of any weight loss program and healthy lifestyle. This Gratitude Meditation is the perfect way to help you center and ground before the holidays, but it’s also the perfect way to build confidence and joy around health and fitness! As a weight loss coach, I love talking about this subject because it’s so valuable— feeling positive leads to better health—and I’m all about your best health! A recent scientific study followed three different groups of people. The first group kept a daily gratitude journal. The second kept a daily journal of everything that irritated them throughout the day, and the third group just wrote about what happened during their day. It probably doesn’t come as a surprise, but the first group had the most positive outlook on life after the study was over! If you want to lose weight and feel great, there’s more to it than just hitting the gym. In my weight loss program for women, I coach my clients about how to create their reality through intentional and positive thinking. What we think about and how we feel affects what we do—right down to our ability to lose weight, make it last, and love our bodies no matter where we are in our health journey! Follow these three easy steps for a refreshing and grounding meditation to help you feel even more thankful this holiday season. Try this Gratitude Meditation every morning or evening. It will help you feel happier and more confident. Our intention this holiday season is gratitude. Pick one thing you are thankful for and hold it in your mind as you continue with the following two steps. Take a moment to connect with yourself. Anchor your body by either resting your hands on your thighs, placing a hand over your heart, or pressing the thumb and forefinger together in a mudra of courage and confidence. Now, begin breathing slowly in and out through your nose. Pay attention to your breath and just let it flow as it will. Do this for three minutes (or more if you want to!) and let thoughts in your mind float by like clouds. If your thoughts stray, come back to your breathe and your intention of gratitude. If you want to step up your meditation, you can practice nostril breathing. Take a thumb and put it over one nostril. Breath in through the opposite nostril. Then, plug the side you just inhaled through and exhale through the other nostril. Continue switching back and forth breathing in one nostril and out the other. Nostril breathing helps balance your parasympathetic and sympathetic nervous system, while helping you be fully present and focus on your gratitude. Health & Fitness Coach Stephanie Mansour breaks down common candy favorites to give you recommendations on which to opt for as the Halloween bowl sits tempting you after the holiday! Indulge your sweet tooth and stick to your weight loss goals at the same time! It’s not just kids who love Halloween candy. If you’re tempted to dip into the candy bowl but are concerned about weight loss—good news! You can enjoy sweet treats and stay slim through the holidays with smarter candy choices. Yeah, you heard me! And I’m a weight loss coach so you can trust I know what I’m talking about! Sugar in moderation is absolutely fine. My goal for all the clients in my weight loss programs for women is to simply change their mindset about candy and cravings. You see, when your body is low on fuel it craves more sugar and carbs and you’re more likely to eat a lot of sweets and fast. Give your body some good fuel first and the craving will subside. Then you can indulge your sweet tooth with a piece of candy rather than the whole bowl! Remember to eat it slowly, savor it, and pretend it’s the most expensive piece of candy in the world! Enjoy the sweets without feeling those intense sugar craving by eating a balanced diet of protein, fruits and vegetables. Before rewarding yourself with a chocolate bar make sure you eat some protein first. It’s as easy as that. 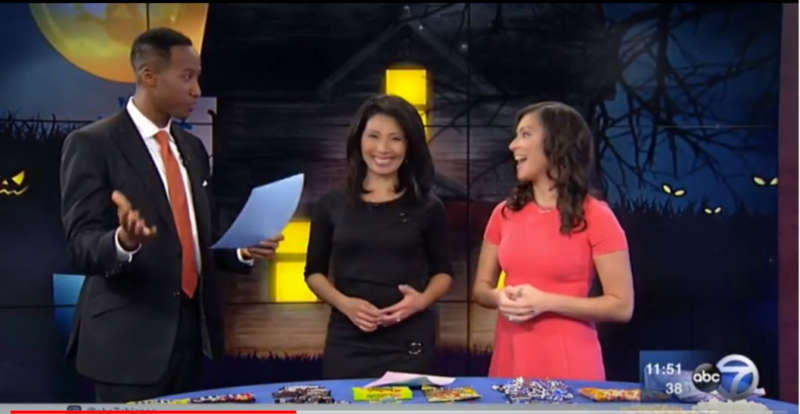 Which Halloween Candy is Healthier? While peanut M & Ms have more calories they also have more protein! And that’s a win!This means, if you’re going to eat sugar might as well give it some good protein at the same time because it is healthier than just sugar alone. Again, Snickers Bars have nuts so they have more protein making it the healthier option over a Milky way. Make sure you stick to a snack size serving though instead of a full-size candy bar. The less sugar and the fewer ingredients—the better! Regular gummy bears have ½ the grams of sugar as Sour Patch kids. They have the same number of calories, but avoiding excess sugar is what keeps you healthier. One mini Peppermint Patty is 120 calories or you could eat three peppermint candies at just 60 calories! Based on calorie count, peppermint candies are better. If you’re craving chocolate though, go for a dark chocolate Peppermint Patty over other white or milk chocolate options because it has antioxidants and less cream and sugar. Get your sugar fix and a satisfying crunchy snack with Kettle Corn! Make your own and pop it in your microwave and save yourself at least 50 calories compared to candy corn. Kettle Corn has a lot less sugar and is good source of fiber! Weight Loss Coach and Fitness Expert Stephanie Mansour dropped by Fox Chicago to demonstrate the workouts to do if you’re short on time and low on inspiration. Try these simple ways to lose weight while you build strength and confidence. Watch the video to get great weight loss tips and learn easy workouts you can try today. Even though I’m a weight loss coach, even I don’t always have time to hit the gym for a full hour or two! But that’s why I know firsthand the benefits of small, intentional workouts done throughout the day. Try these fun and easy workouts to support your own weight loss and fitness goals no matter if you’re at home with the kids or busy at the office. Mornings are the best time of day to hit it hard! Go for high intensity interval training. Need some extra motivation? Lay out your workout clothes the night before. Shoot for a 20-minute workout, but even if you can only do 5 minutes, that’s okay—do it! Every little bit helps your weight loss and fitness goals. Do squats and lunges for strength training but also try adding arm presses in at the same time. This is great if you’re short on time because it gets your heart rate up and combines two workout moves in one. Bam! The goal at lunch isn’t to work up a sweat since you probably won’t be in workout clothes! Try these low intensity movement exercises to keep your brain fresh and alert and your body limber and strong. Chair Pilates: Close your office door and do some simple chair Pilates! Or if you can snag an empty conference room, throw down a mat and do ten minutes of Pilates. Office Walks: Walk around the office at lunch or march at your desk. You might feel silly at first but then you’ll feel great with more oxygenated blood circulating through you. Our bodies crave movement so start marching, pump your arms, do a little dance, whatever! Mini Breaks: Little workouts throughout the day keep your brain in a happy state of mind and more likely to take advantage of a class or gym workout when the opportunity arises. Whether at work or at home, set a timer on your phone so every hour it reminds you to get up and walk around or do a quick set of exercises for five minutes. At the end of the day, the goal is to lower your body’s cortisol levels. Cortisol (the stress hormone) regulates your metabolism helping you lose weight and controls blood sugar levels and reduces inflammation. All these things directly influence your health, energy, and weight. Ease insomnia: Many of the clients in my weight loss programs for women have trouble falling asleep. Relaxing yoga and meditation helps them sleep better and lose weight (for real!). So don’t worry about working up a sweat at night—that’s going to make it even more difficult to fall asleep! Light Yoga: Destress from a busy day with some light yoga. Do a half of a sun salute and other standing yoga poses, or try lying on the ground with your legs up in the air against a wall. Chicago Weight Loss Coach Stephanie Mansour and TV Personality Jenny Milkowksi demonstrate a dynamic hamstring exercise you can do as a partner workout. Grab a ball and check out the video to learn how to stabilize your core, improve your posture, and increase power and mobility all by strengthening your hamstrings! You know those ‘ol hamstrings you never think about? Turns out they are good for more than you realize! Got lower back pain? It’s probably a sign of tight hamstrings! Get stretchin’! Prone to leg injuries or poor posture? Build hamstring strength. The clients in my weight loss programs for women get more than just support to shed their extra pounds. As a weight loss coach, I know that to feel great about your body you need to be able to move freely in your body. If you want more flexibility and more strength to do the activities you love or have always wanted to try, small daily practices go a long way! Grab a friend and try to this dynamic hamstring workout! It’s an easy and fun exercise that will help lengthen and strengthen your hamstrings (and your glutes! Bonus!). 1) Hold your ball in front of you and face your partner. 2) Pull your abs in tight and extend your arms out in front of you with the ball. 3) Extend of leg back to work the hamstrings and glutes. 4) Bring the leg back to center. 5) Repeat with opposite leg. 6) Do a set of 10, and if you’re up for it—challenge yourself to do three sets!